K.D. 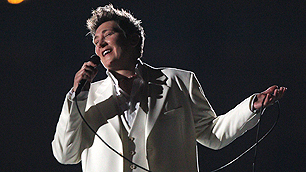 Lang memorably performed Leonard Cohen's epic song "Hallelujah" barefoot during the 2005 Juno Awards. Now Canada’s music awards will honor the iconic singer-songwriter with induction into the Canadian Music Hall of Fame at the upcoming 2013 Junos. The pop singer has earned eight Junos and four Grammys over her 25-year career, and will receive her tribute April 21 as the Junos air on CTV from Regina, Saskatchewan. “To be included in the lineage of Canadian artists who have formed my musical DNA and who remain my mentors, is beyond humbling,” Lang said Tuesday in a statement. Other Canadian Music Hall of Fame inductees include Anne Murray, Joni Mitchell, Leonard Cohen, Neil Young, Oscar Petersen and Shania Twain.